The seven candidates contesting the Presidential Election have given their full backing to the Cliffs of Moher in its bid to become one of the new 7 Wonders of Nature as part of the global competition scheduled to conclude on 11th November next. On recent visits to County Clare, many of the candidates have incorporated a visit to the Cliffs of Moher as part of their itinerary and have expressed their strong support to see the Cliffs make it onto the global listing of the new 7 Wonders of Nature. 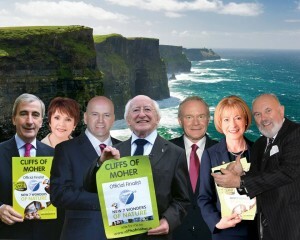 “We very much welcome the support of all of the Presidential candidates for the Cliffs of Moher. It is the only Irish entry in this world wide competition and has done tremendously well to make the shortlist from the initial 440 sites that competed. We have been mounting a very strong campaign to secure one of the new 7 Wonders of Nature for Ireland and I am delighted that the next President has given full backing to the Cliffs of Moher to achieve that aim. I think this support underlines the importance that the future President attaches to Ireland being represented in the official list of the global new seven wonders of nature. The Cliffs of Moher is an icon of Ireland and I would urge everybody to support the Cliffs of Moher in the final 18 days of the campaign”. The final selection of the new 7 Wonders of Nature will be determined by the numbers of votes cast for each of the 28 finalists. Voting can be done either online at www.new7wonders.com or text MOHER to 53131 (texts cost 30c each). Voting in the competition closes at 11.11 a.m. on 11th November, 2011 (11/11/11).